Palate Cleansing is a fantastic technique to utilize in your recipes when undergoing cancer and chemotherapy treatments. Combating metallic taste during cancer and chemotherapy treatments can seem like an extremely daunting task. But with the cooking techniques that I teach inside of my cookbook, Cooking for Chemo …and After!, it really does become possible to rid your mouth of that nasty metallic taste that is typically associated with cancer and chemotherapy treatment. The most effective cooking technique to curb metallic taste is what I call the Palate Cleanse. Palate Cleansing is a simple cooking technique where you use acidic sour flavors to create a lightweight feeling in your mouth and on your tongue when you eat food. Palate Cleansing is an easy to apply cooking technique to use on your loved ones with cancer who can only eat a couple spoonfuls of food before becoming exhausted from eating. Palate Cleansing also helps reduce the metallic taste in your mouth. Palate Cleansing does this by cleaning your taste receptors after every bite and overpowering the metallic taste leaving a clean fresh taste in your mouth when eating. Now, before you say “Ew gross.” You need to know that the end result of your recipe won’t taste like a jar of pickles! When the palate cleansing technique is applied correctly, you won’t even notice it in your food. 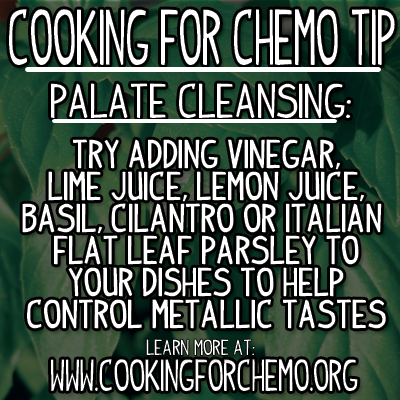 How do you perform a Palate Cleanse when cooking during cancer treatment? Palate Cleansing is very easy. Simply add a tablespoon or two of red wine vinegar and an equal amount of sugar to whatever recipe you are cooking. The sugar masks the taste and flavor of the vinegar, but still allows it to work its magic in your recipe. You know you have the right amount of vinegar when the recipe is lighter, but NOT sour or altered in taste and flavor. In addition to vinegar, fresh herbs like Italian flat leaf parsley, basil, and cilantro are great palate cleansers when cooking as well. Simply chop them up fresh and add them to the top of your recipe before breakfast, lunch, or dinner. Citrus juice can also be added as a palate cleanser. Simply squeeze the citrus fruit over the dish before serving. Take care not to cook the citrus juice into the recipe or it could lose its effect. As you can see, with a few simple tricks, combating metallic taste when eating and cooking can be a breeze! You can purchase Cooking for Chemo …and After! by going to Amazon or Barnes and Noble.